The company announced on Wednesday that it has filed complaints against both Apple and Research in Motion, alleging patent infringement in the lawsuit filed with the U.S. International Trade Commission. 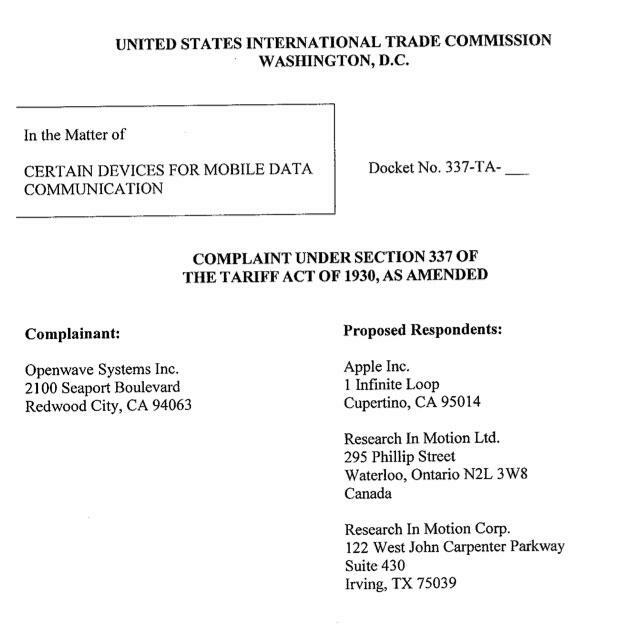 As is standard in such filings, Openwave has asked the ITC to ban the import of smartphones and tablets made by Apple and RIM. "Openwave invented technologies that became foundational to the mobile Internet," Ken Denman, Chief Executive Officer of Openwave, said in a statement. "We believe that these large companies should pay us for the use of our technologies, particularly in light of the substantial revenue these companies have earned from devices that use our intellectual property." "Before filing these complaints, we approached both of these companies numerous times in an attempt to negotiate a license of our technology with them and did not receive a substantive response." "In the end, litigation is the only way we can defend our rights against these large companies that have effectively refused to license the use of the technologies we invented, are using today, and are continuing to develop for our customers," Denman said. "We are proud that our technology is helping deliver such a rich mobile internet experience to consumers around the world." In its press release, Openwave touted that in 1997 it was the first company to enable operators to deploy mobile Internet browsing, while in 2001 it was the first to provide technology for photo messaging. The company said it owns about 200 patents related to its software business.